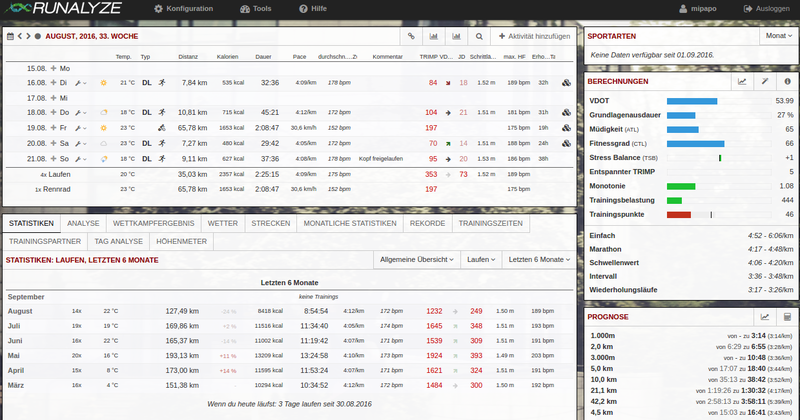 A web application to analyze your training – as detailed as nowhere else. TRIMP is short for Training Impulse and gives you the opportunity to compare activities of different intensity levels. VO2max is a scientific metric for the maximal oxygen uptake that is highly correlated with your maximal running performance. In addition to common calculators that estimate VO2max based on a race result, we estimate your effective VO2max for every activity based on the relation of your heart rate and pace. 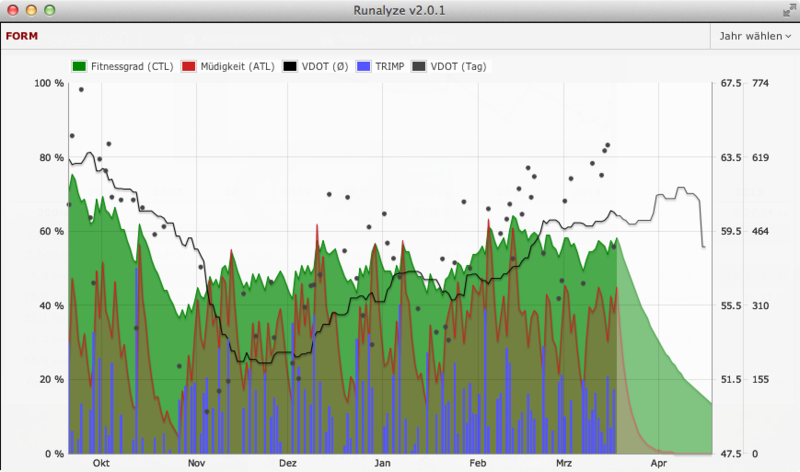 Runalyze goes one step ahead: We estimate your current effective vo2max shape based on your heart rate and pace of every activity. You can choose your favorite model to predict your upcoming race: CPP by Robert Bock, a simple method by Herbert Steffny, calculations by David Cameron or our vdot method based on Jack Daniels. Most models predict your race performance based on your personal bests on different distances, but that does not always fit your current shape. Our vdot estimations can be used to give much more accurate predictions. Don’t loose sight of anything. You can always see your latest activities (or browse to any other time range). 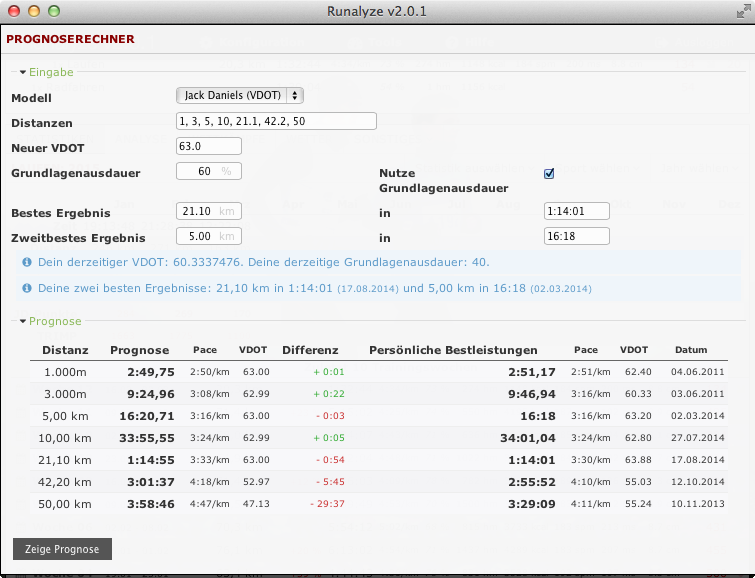 Runalyze offers you a lot of statistics to analyze your training. You can choose which panels to show up on the right side. Direct import from garmin devices via garmin communicator. Upload for all common formats (*.fit, *.fitlog, *.gpx, *.hrm, *.kml, *.logbook, *.pwx, *.slf, *.sml, *.tcx, *.trk, *.ttbin, *.xml). Export single activities as tcx-, gpx-, kml- or fitlog-file. GPS-based elevation data can be corrected via srtm data. You can choose the algorithm and settings for your elevation calculation. By default all your data is private. You don’t need to be in our community. You can search any activity based on various parameters. Dynamic graphs with tooltips, fullscreen mode and the option to save them. Analyze your training based on specific zones. Define your own sport/activity types. You can publish your activities – if you want to. Runalyze is completely configurable. You can decide by yourself which information of your training you want to record and which statistics are being displayed on which place. Runalyze is created by athletes for athletes. Whenever you have comments, problems or wishes: Please contact our Runalyze team. It's near and dear to us.